In the golden age of the steamer, the rich bounty of the Eastern Shore was transported down the Chester River and across the Chesapeake Bay to the port of Baltimore. For over one hundred years, vessels like the Maryland, the Chester and the B.S. Ford traversed these winding waters laden with fruit, grains, crabs and oysters. For a dollar, passengers could enjoy the novelty of a ride and the slow panorama of the shoreline. Through freeze and fog, skilled captains plied the waterways until the last of the steamers—the Bay Belle—made its final passage in the 1950s. 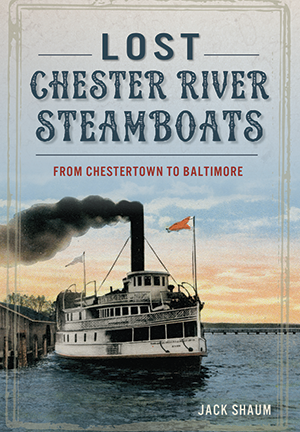 Author and historian Jack Shaum journeys back to the bygone days of the Chester River's steamboats. After retiring from a nearly thirty-year career as a news anchor and reporter for news-talk radio station WBAL in Baltimore in 2002, Jack Shaum began writing for the Bay Times and Record Observer newspapers in Queen Anne's County. Shaum was the editor-in-chief of the quarterly journal of the Steamship Historical Society of America, and he is the co-author of Majesty at Sea. Shaum has received professional awards from the Associated Press and the Society of Professional Journalists, among others.